Delhi is aptly called the city of cities. Purana Qila is the oldest fort in Delhi and some recognise it as the first city of Delhi, once inhabited by emperors like Humayun, Sher Shah Suri, and Hemu Vikramaditya. This place is also believed by many to be the site of Indraprastha, the ancient town mentioned in the epics. Sher Shah rebuilt the fort at the same place but died before the construction was complete and it was completed later by his son Islam Shah. When this fort was built it was situated on the banks of river Yamuna, but since then the course of the river has changed. 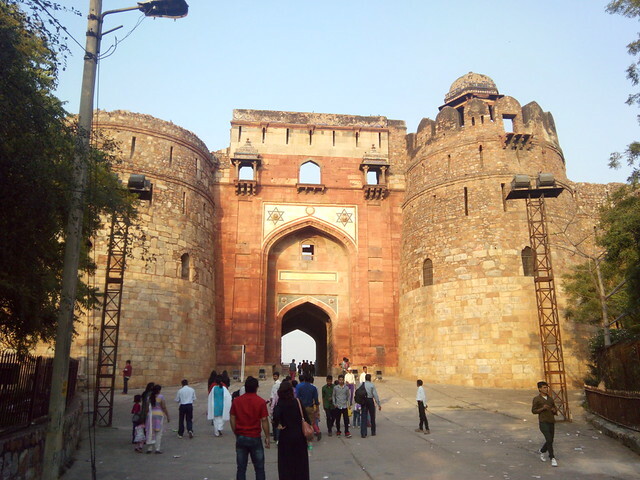 There are three entrances to the Purana Qila. The main entrance known as Bada Darwaza was one from where entry is allowed. It was a gate having all the characteristics of the fortified structures. There were towers on the second floor on the either side of the gate. At that time, soldiers must have manned the gate from these towers. There were two other entrances : Talaqi Darwaza or forbidden gate and Humayun Darwaza, possibly known as such because it may have been completed by Humayun. 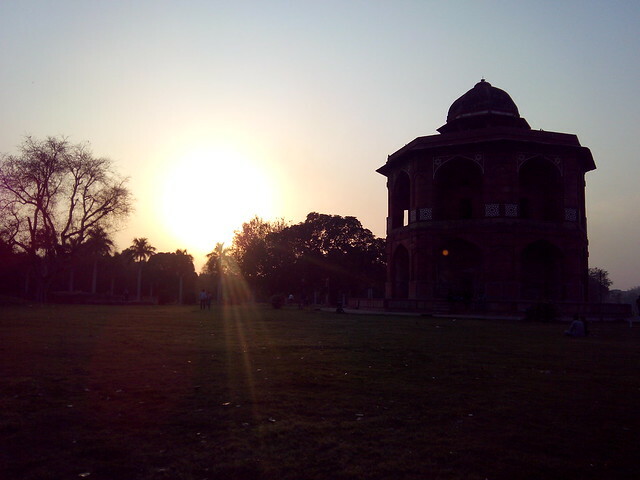 Humayun Darwaza is visible from nearby Delhi zoo. The Talaqi gate is now closed for all purposes. One has to go around the lake to see the Talaqi Darwaza. The lake is outside the main walls of Purana Qila on its western side. It was a common practice during those times to have a lake around the outer walls to reinforce the security of forts as was the case with Tughlaqabad Fort, although the lake has dried since then. Today, boating facility is present in these lakes. When we entered the fort premises, we saw sprawling lawns with buildings to been seen sparingly. We saw the double storied structure of outer walls on the western side and that of the main gate, Bada Darwaza. Whatever remains are standing in Purana Qila are in good condition preserved by Archaeological Survey of India. We then went towards the Qila-i-Kuhna Mosque. It was built by Sher Shah. One of the first buildings in the region to use pointed arches, this mosque is in good condition even today. In its courtyards, there was even a water tank with a fountain. The second storey has balconies accessible via stairs which were probably built for female courtiers to pray. We then saw some excavations done on few sites and the material excavated was displayed there. Such excavations by ASI have shown the inhabitation of this place since ancient times. Then there was an octagonal building known as the Sher Mandal. It was a double storied structure planned as an observatory and personal library of the emperor. Today entry to the Sher Mandal is prohibited. This was also the place where Humayun fell from stairs of the second storey to his death while hurrying for evening prayers after stargazing. Sher Mandal in Purana Qila. Then we also saw Hammam, a royal bathhouse. A plaque read there, "The remains of terracotta pipes and a ribbed water chute can still be seen around a room measuring some 3.2 metres square. Such bathhouse, with provision for hot and cold water and even steam rooms, were an important part of the Mughal culture. In the years after the abandonment of the fort as a capital of the empire, this structure was forgotten and built over. It was revealed when the clearance of the village Indraprat and conservation of the site was undertaken by the ASI in 1913-14." The Purana Qila also has daily light and sound show describing the history of the seven cities of Delhi. Unfortunately, we could not see that as the entire show was booked by a school for an exhibition. 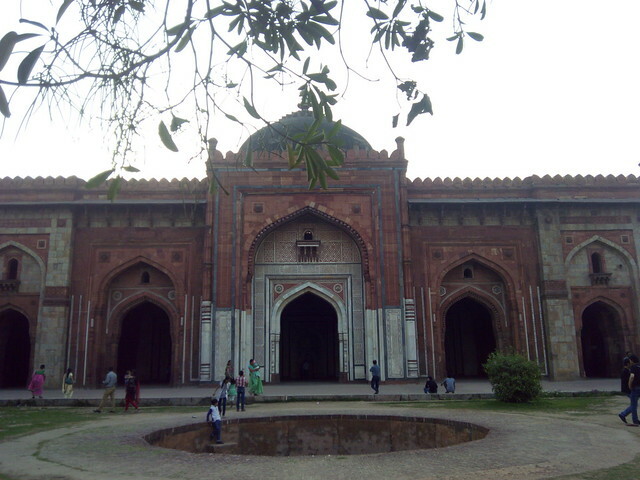 The show takes place near Humayun Darwaza inside the fort. The boundaries of the Purana Qila on the eastern side were high and steep. Purana Qila was considered unlucky for the rulers as most of them had short reigns and that is why later emperors shifted their capital to other cities in Delhi. We did some sunset photography in the lawns. See Purana Qila in Pictures also.